English Silver of the Seventeenth Century, The Bowes Museum, 1961, cat. no. 34. The exceptionally rare form of this early chocolate pot is probably based on a Chinese ginger jar. While a small group of chocolate pots of this form is known, only one other example from Newcastle survives. It was made by Eli Bilton, 1694. In her book Old Country Silver, Margaret Holland describes the present chocolate pot as "having an unusual amount of decoration for a Newcastle work" (1971, p. 77). A similar plain example from Leeds is illustrated in Michael Clayton, The Collector's Dictionary of the Silver and Gold of Great Britain and North America, 2nd ed., 1985, p. 90, fig. 124. 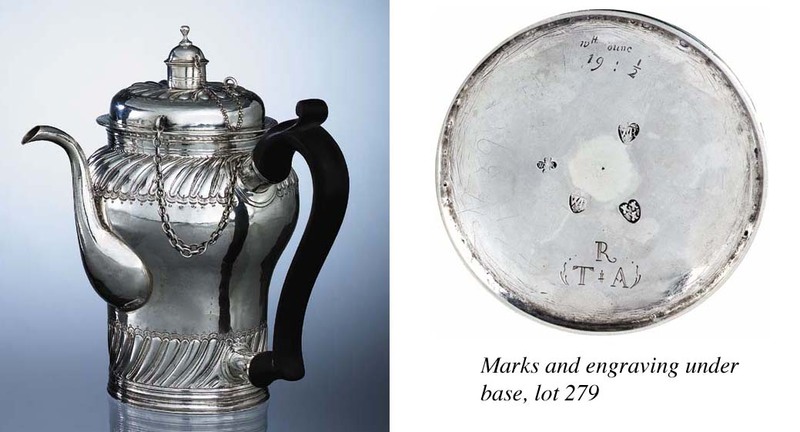 Another plain example of London, circa 1685, maker's mark IW, tun below, was sold from the Collection of May and Howard Joynt, Christie's, New York, April 19, 1990, lot 344.